You will need this information when ordering replacement strings. 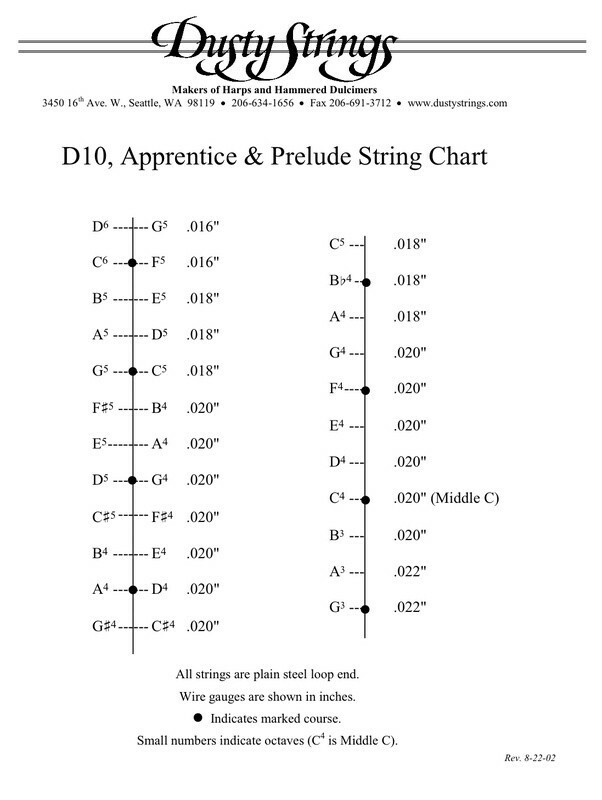 The Chart that relates to your Dulcimer will depend on the size of your Dulcimer. 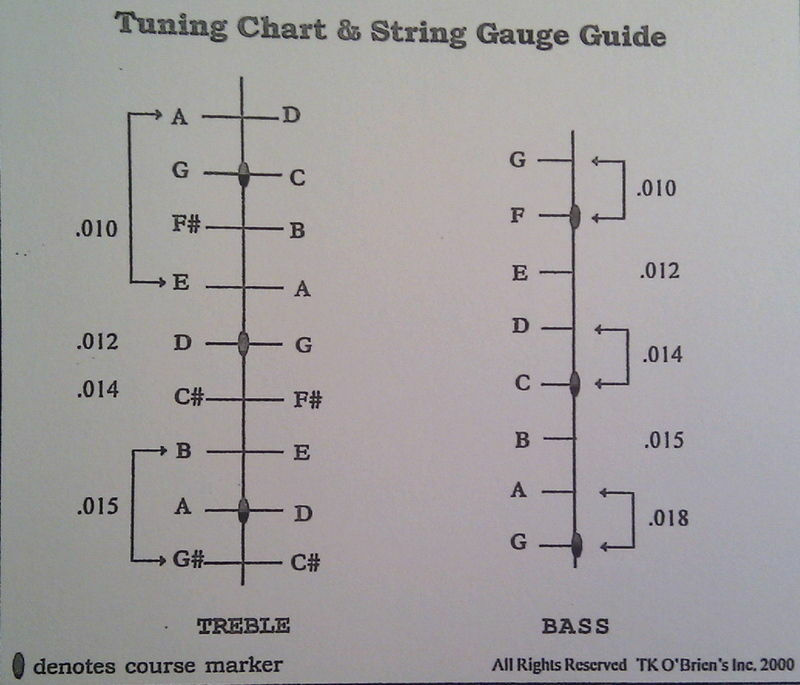 Tuning chart for the 9/8 Hammered Dulcimer. - 9/8 relates to the number of Strings on your Dulcimer (9 sets of strings on the left treble bridge and 8 sets of strings on the right Bass Bridge). This is the smallest of the Hammered Dulcimer family. Examples of this size Dulcimer are the T K O'Brien 9/8 backpacker (travel) Dulcimer and the Music Magic Table Top Dulcimer. Tuning chart for the 12/11 Hammered Dulcimer. - 12/11 relates to the number of Strings on your Dulcimer (12 sets of strings on the left treble bridge and 11 sets of strings on the right Bass Bridge). This is the most common size of the Hammered Dulcimer family. Examples of this size Dulcimer are the TK O'Brien 12/11 Dulcimer, The Dusty Strings D10, Apprentice & Prelude Dulcimers, Both the Roger Frood Silkie and Laptop Dulcimers, and both the Music Magic Harmony & Dizzi Signature Dulcimers. Tuning chart for the 16/15 Hammered Dulcimer. 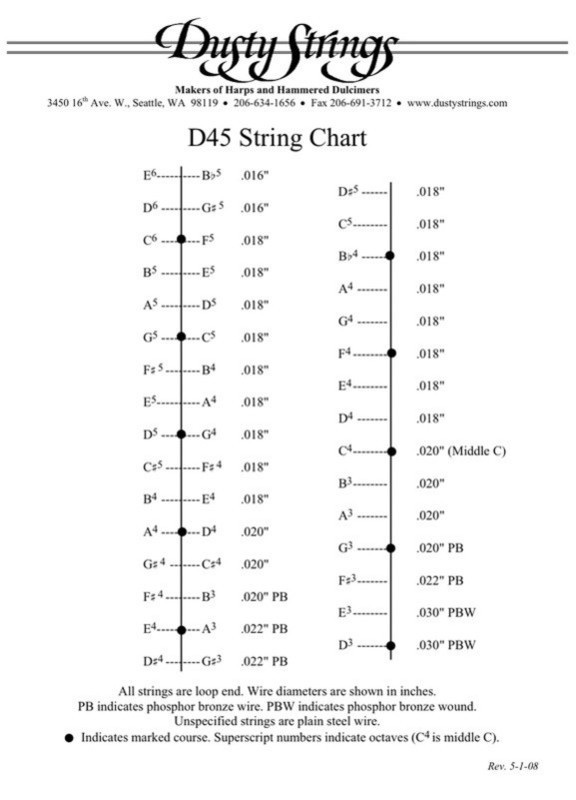 - 16/15 relates to the number of Strings on your Dulcimer (16 sets of strings on the left treble bridge and 15 sets of strings on the right Bass Bridge). This is the most common size of the Hammered Dulcimer family. Examples of this size Dulcimer are the Dusty Strings D45 Dulcimer and the Music Magic Maestro Dulcimer.